About 22,000 turkeys on four premises are being culled as a precaution, after the virulent H5N1 strain of bird flu was found in turkeys on a Suffolk farm. Officials said it was not yet known if the birds had contracted the virus. A cull of 6,500 birds is also nearing completion at Redgrave Park farm, near Diss, where the infection was discovered on Sunday. Gressingham Foods' subsidiary Redgrave Poultry, which runs all five sites, said they shared the same farm staff. A "direct link" had thus been established between them, it said. A 3km (1.9 mile) protection zone and a 10km (6.2 mile) surveillance zone, where movement of birds is restricted and poultry must be isolated from wild birds, is in place around Redgrave Park. One of the four sites is within the protection zone and the other three lie within the wider restricted zone, covering much of Suffolk and Norfolk. The sites are: Stone House Farm, in West Harling, and Bridge Farm, in Pulham, both in Norfolk, and Grove Farm, Botesdale, and Hill Meadow, Knetishall, both in Suffolk. Geoffrey Buchanan, operations director, said: "While naturally saddened to see so many birds culled, we fully agree that the primary concern has to be the containment of the outbreak." Officials had been investigating any "dangerous contact" between the farm and other flocks in the area, either through human, wild bird or poultry movement. Acting chief vet Fred Landeg said: "At this stage we have not confirmed disease on any of these four premises. "This is a precautionary measure taken to prevent any potential spread of the disease." He urged poultry keepers in the area to be "extremely vigilant" for signs of the virus and to practice the "highest levels of bio-security". The Department for the Environment, Food and Rural Affairs (Defra) said there were more than four million registered poultry within the surveillance zone, with a further 25 million within the restricted zone. 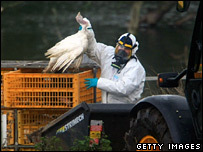 Defra confirmed on Tuesday that the virus found in turkeys on Redgrave Park farm was the highly-contagious H5N1 strain. The slaughter of about 5,000 turkeys, 1,000 ducks and 500 geese at the premises was close to completion on Wednesday evening. Mr Landeg said his department was keeping an "open mind" about how the virus reached the farm. However, he said early indications were that it was related to outbreaks in the Czech Republic and Germany - which suggested a wild bird source. The affected birds were free-range - meaning they had access to the outdoors - and were located near a lake used by a number of wild fowl. However, Redgrave Poultry said turkeys were prevented from accessing the lake by electrified fencing, empty ground and a farm road, and all feed and water was provided indoors in order to discourage wild fowl. The news of the outbreak is the latest blow to farmers who are already dealing with bluetongue and foot-and-mouth disease. But the National Farmers' Union's poultry board chairman, Charles Bourns, said he did not think there was a danger of turkey shortages over the busy Christmas period. "This is a disease on the one farm, and I don't think it is going to get out and kill five million birds, most of which are indoors and should have no contact with wild birds," he said. All the major supermarket chains say turkey supplies are so far unaffected. There was a H5N1 outbreak at a turkey farm, at Holton in Suffolk, in February. Although a report by Defra into that outbreak initially blamed wild birds, it later concluded the most likely source of infection was imported turkey meat from Hungary. Redgrave Poultry said none of its birds was imported. Are you in this area? Are you a farmer who is concerned about the latest outbreak? Has your poultry been affected by bird flu? Send us your reactions.